Geddar, who runs the satirical magazine Baboubi, reposted on Facebook Sunday, as a posthumous tribute, a cartoon previously posted by Nahed Hattar who was shot dead outside an Amman courthouse earlier that day. Hattar had been facing charges over the illustration he posted on Facebook under the title "God of Daesh" (ISIS) showing a bearded man in bed smoking with two women lying on either side, and addressing God as a servant. Any depiction of God is prohibited under Islam. Hattar was hit by three bullets before the alleged assassin was arrested at the scene. Geddar said he received several threatening messages and comments, including: "Your fate is death and slaughter – you are the enemy of God." 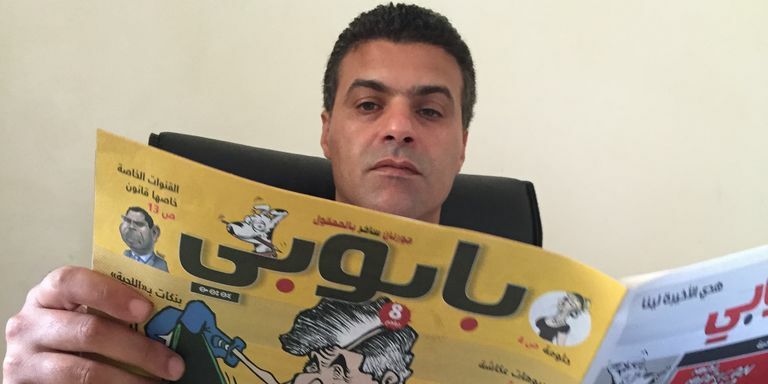 "I consider this comment to be a direct threat, a call to kill me just because I republished the drawing that led to the death of the Jordanian writer," he told AFP. He called on the authorities in Morocco to protect him, saying: "The police must investigate and cannot leave unpunished such calls for hatred, violence and death." Geddar republished the illustration accompanied by a quote from French cartoonist Charb, who was killed along with 11 others in the attack on satirical weekly Charlie Hebdo in January 2015 in Paris.